I have yesterday this error (see picture), and this comes again and again, no matter how often I try to press again. I have already thrown my Themler down and again with Themler downloaded and installed, without success. I also tried to restart Themler, but it will remain when I want to open a Joomla Theme when updating, and shows the error. If I open a new theme, and do not press to update, the error also appears. You work with Themler desktop for Joomla, right? Could you please try temporarily disabling antivirus and firewall and try to run Themler? 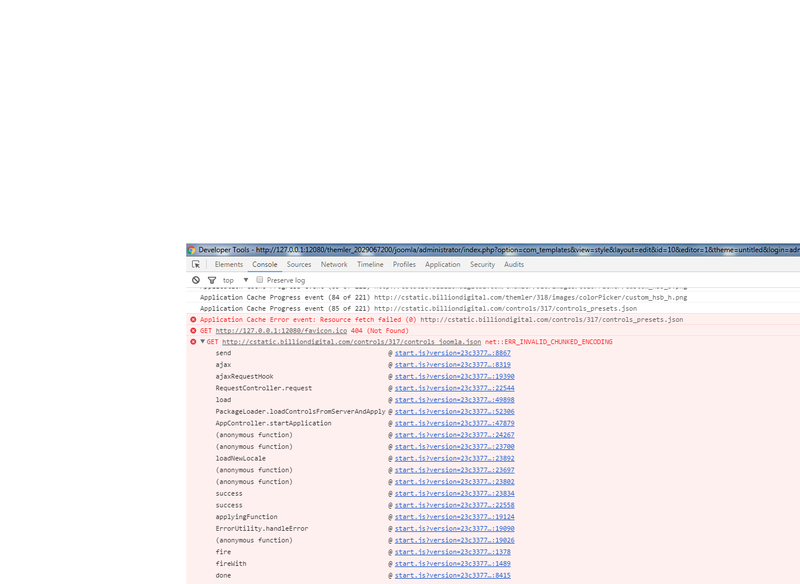 Also - does the error appear with other CMS's or only with Joomla? Thanks for the fast answer, i work with desktop for Joomla! I have it tested with disabled firewall an antivirus, and the same error appears. I have now taken an older theme, and installed on a live joomla there is not the error. However, I can not press update. Has the Themler for Live Joomla the same size as Themler for Desktop? Thanks for details. The theme itself should have the same size no matter where it is installed. 1. Backup all theme folders somewhere on your computer. The themes are located at the path like C:\ProgramData\Themler\hd_data\themler_xxxxxxxxx\joomla or any other CMS/eCommerce. 6. Download latest version of Themler for Windows from themler.com, install it and try to start with Themler for Joomla and create a theme. I have followed all the steps as described by them. The uninstallation and installation ran without problems. But when I start Themler and select some CMS or HTML5, I get the following error message (see picture). here is the diagnostic file. I found the error, and I had to laugh as I found it. I had forgotten our hardwarefirewall. And this happily blocked everything. Thanks for your time. And sorry for bad english. You are welcome! Please feel free to contact us if any other questions or issues appear.